We hope you’re eager to start creating Peace Week 2017. We need your help to make it happen! Let’s work together across our individual and organizational impact and presence in the community. Come to the Peace Week Delaware 2017 kick-off meeting to learn how. Wednesday, April 19, 6:00 to 7:30 p.m. Doors open at 5:30 for meet and greet. This kick-off will be a facilitated, inclusive, idea-generating session. We welcome your ideas and participation—whether or not you or your organization was involved with or supported Peace Week Delaware 2016. Let’s widen the circle of peace! If you have discussed your involvement with Peace Week Delaware with a friend or colleague, or know of someone who may want to help out in 2017, please forward this email and report. Your friends at the Movement for a Culture of Peace. Can’t attend the kick-off but still want to be involved? Email us at volunteer@peaceweekdelaware.org. The Peace Week Delaware steering committee has met several times since the close of the highly successful first Peace Week. More than 40 individual events, displays, and meetings were held during the eight-day “week.” Feedback from event sponsors and attendees was very positive. It was decided in mid-November to organize a second Peace Week Delaware in Sept. 2017. It was also decided to continue Peace Week as a project of Movement for a Culture of Peace. There will be some reorganization of the committee structure of both groups to eliminate duplication of effort and overlapping responsibilities. If you would like to join the Movement for a Culture of Peace or Peace Week Delaware steering committee to help organize Peace Week Delaware 2017, email info@peaceweekdelaware.org. Groups and organizations that wish to hold an event during Peace Week Delaware 2017 should begin planning now. Event proposals will be accepted beginning in April 2017. Today is International Peace Day, a global celebration of the possibility of peace. In Delaware, Peace Week continues on its fourth day, with six events statewide. In New Castle County, the third of four sessions of the podcast Remaking “Murdertown”, a YWCA Delaware event focusing on their mission to eliminate racism and empower women, the Jaycees’ model for planning a peace project and an interfaith evening featuring international peace activist and founder of Campaign Nonviolence, John Dear. In Rehoboth, a March for Peace honoring Peace Week Delaware and A Day of Peace with dedication of a Peace Pole. Events continue statewide through September 25. Today’s events: Complete details here. Third of four sessions for the podcast Remaking Murdertown. This four-part podcast follows one individual, Ricky Reyes, as a case study in the roles that poverty and public policy play in Wilmington crime. Bring your lunch and join us in listening to Episode 3 “Tidal Wave,” and then discussing the episode together. The final episode will be shared on Sept. 22. How the YWCA Delaware addresses racism and empowers women, and tour the Home-Life Management Center. Learn how to plan a project to work toward peace in your community. An evening of peace with legendary peace activist and founder Campaign Nonviolence, John Dear, nominated by Archishop Desmond Tutu for the Nobel Peace Prize. March with banners and posters down the boardwalk to Baltimore Avenue and on to Camp Rehoboth. Local musicians from various groups will play and sing, followed by a brief program acknowledging the importance of peacemaking in all major faiths. The following Delaware Voice column was published by the Wilmington News-Journal on Sept. 9. It is available online here. Cynics say that the “protection industry,” military, police, criminal justice world and prison system, have overwhelming economic and political power. Perversely, they say “non-peace” is in “our” best economic interests. Yet people are uniting to demand peaceful behavior from our families, communities and governments. In Delaware, for the first time, people throughout the state will celebrate the benefits of peace for an entire week, Sept. 18 to 25. Peace Week Delaware has more than 30 events statewide and more than 100 volunteers, sponsors and funders. The work to bring Peace Week to Delaware is forming stronger coalitions to build a culture of peace in our state and our world. A change of attitude, that a culture of peace is possible, benefits us all. Peace and peaceful actions make sense because peacemaking is our number one strategy to overcome fear and violence. If we adjust our mindset and actions, we can make peace possible now. Consider the benefits of peace and peacemaking: We will rely on love and understanding rather than fear and separation. We will reduce suffering and loss caused by violence. 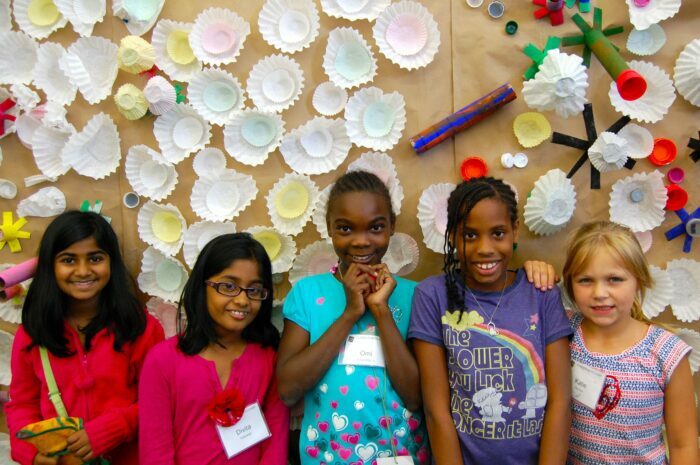 We will educate our children to use alternatives to violence for conflict resolution. We will seek reconciliation rather than separation and revenge. With our children and neighbors, we must learn to talk, listen, understand, and act for peace as the default alternative to violence. We must preach the blessings and practices of peace from our pulpits. We must demand that our governments act in ways that support peace. Real social and economic justice depend on this. And there is a Peace Dividend. A peaceful world, nation, state and community will spend fewer resources on the protection industry. Shift economic resources from prisons and punishment to jobs and programs that produce opportunities for all people. Create a culture that benefits from the best of us all. Real peace, right now, is more than idealistic lip service. Our digital world is an asset to people and groups that are peace builders. New connections – like those being built by Peace Week Delaware – allow peacemaking to serve people as never before with peace education, peace programs and peace networking. Our grassroots coalitions and combined advocacy will better compete with the many forms of violence that dominate our culture. Along with our neighbors, those who we know and those who we have yet to meet, we are committed to promoting the actions and blessings of peace that will lead us to a better society. “Neighbors joining together to build peace in the First State” is the theme for Peace Week Delaware. Michaelena de Jesus is a mother of two boys, full time optician and community leader of a peace movement called 302GunsDown. Rachel Livingston is the Minister of Social Action at Mother African United Church and worked for the Delaware Repeal Project. Boyd Sorenson is a retired businessman and peace advocate who lives in Yorklyn. After months of planning and lots of hard work by dozens of volunteers and event sponsors, the first Peace Week Delaware will launch on Sunday, Sept. 18. Three events will be held at the Delaware Contemporary (formerly DCCA) at 200 South Madison St., on the Wilmington Riverfront. Additional events will be held in Center City Wilmington and in Rehoboth Beach. Between Sept. 18 and Sept. 25, more than 35 events are scheduled. Peace Week Delaware is an expanded vision of peace led by the Movement for a Culture of Peace, which organized anti-violence marches in Wilmington in 2014 and 2015 and has held monthly public forums on how to achieve peace and address the impact of violence. Peace Week Delaware provides a coordinated outlet for that energy, widening the circle of nonviolent action across the state. A detailed, up-to-date listing of all events is at www.peaceweekdelaware.org/events. 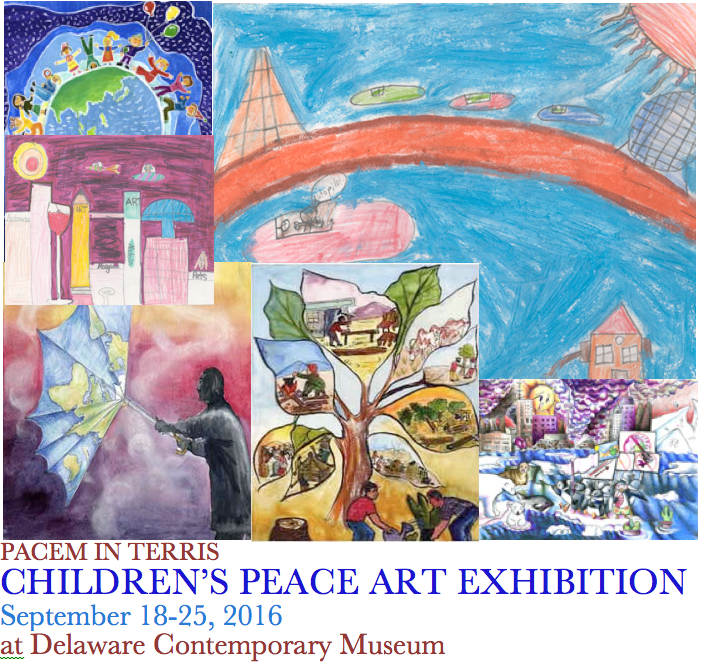 In conjunction with the opening reception for the Pacem in Terris Children’s Peace Art Exhibition, The Delaware Contemporary invites families to create artwork representing their own visions of peace at its regular first Fall Free Family Sunday. Materials provided. All ages welcome! What does peace look like? What does a peaceful world look like? A children’s art exhibit for students in grades K-12 sponsored by Pacem in Terris. Conceived as a dialogue between youth and older citizens, the exhibit features images and words describing the world our youth envision. How will we respond to their vision? Also in Wilmington is a great opportunity to share a potluck meal across religions and cultures at the Episcopal Church of Saints Andrew and Matthew (SSaM), 719 N. Shipley St.
An opportunity to meet our Muslim neighbors and to offer them our friendship. All ages and religious backgrounds (or no religion at all) are invited to come together around a shared meal. Foods from diverse cultures are welcome. 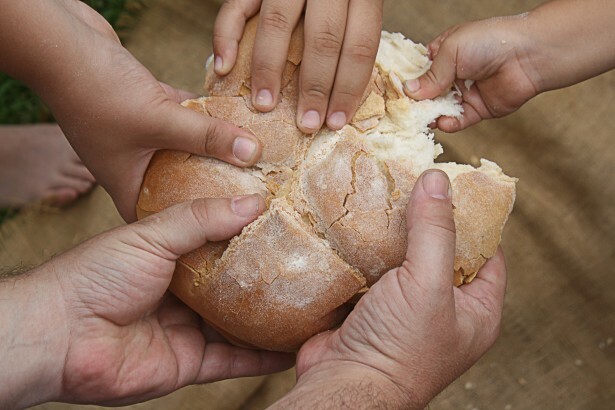 Come as you are—with or without food—to celebrate our common humanity. Advance registration suggested: dlcasson@ssam.org. Sponsored by: Masjid Isa Ibn-e-Maryam and SsAM. The first Peace Week Delaware event in Sussex County will be a learning experience about a much talked-about alternative to incarceration and punishment. The first Peace Week Delaware will launch on Sept. 18 with more than 30 events statewide over eight days—far exceeding organizers’ expectations. Organization of Peace Week Delaware began in February 2016. Since then, Delaware’s Movement for a Culture of Peace (MCP) has partnered with dozens of organizations and individuals across the First State to present a week-long series of events running from September 18 – 25. The purpose of Peace Week Delaware (PWD) is two-fold: (1) To build our state’s capacity to achieve our collective goals for peace and justice by collaborating to create Peace Week together and (2) To offer peace-loving people across Delaware the opportunity to join together to recognize the possibility of peace and energize their actions. Delaware continues to suffer from unacceptably high levels of violence. Government agencies and non-governmental organizations have worked to address this issue without success. The Movement for a Culture of Peace envisions a coordinated approach to building alternatives to the prevailing culture of violence based on education, economic opportunity, anti-racism, equal justice, respect for human rights, equality between women and men, respect for LGBTQ rights, democratic participation, the free flow of information, and disarmament of our neighborhoods. MCP has sponsored monthly forums on peace and nonviolence for two years, as well as the 2014 and 2015 Marches for a Culture of Peace in Wilmington. We believe that change agents are more effective working together—and that collaboration will accelerate positive change across the First State. Our hope is that Peace Week Delaware will become an annual event, broadening in scope, participation, and impact each year. More than 30 events will take place across the First State—things like films, art exhibitions, marches, gatherings, rallies, concerts, workshops, talks, and meditations. Delawareans of all colors, faiths and backgrounds are urged to attend Peace Week Delaware events to share with others in building peace across the First State. Are You Ready for Peace Week Delaware? 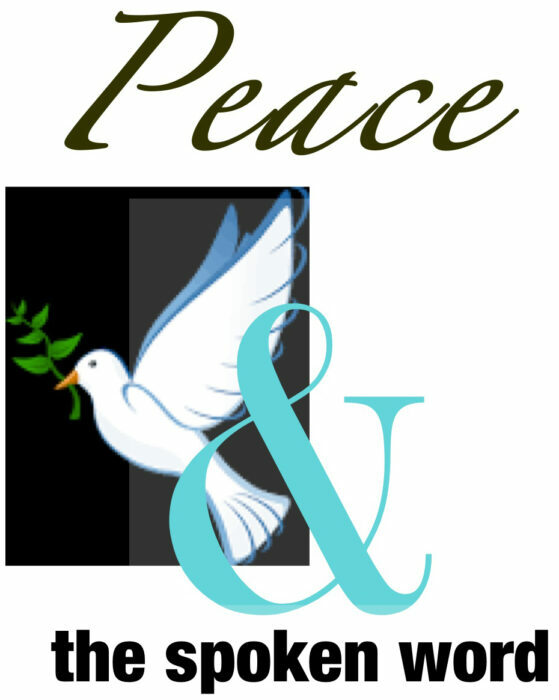 Peace Week Delaware (PWD) is gaining momentum and attracting attention across the First State. Our inaugural series of peace-themed arts events, workshops, lectures, concerts, films, and festivals will run from Sept. 17 to 24 – Sunday to Sunday – bracketing International Peace Day on Thursday, September 21. Create – Create an event and have it added to the PWD calendar! provide! Online event registration will open on June 1. We will accept event plans at any time – but after August 15, we can’t add your event to our printed program for Peace Week. Volunteer – We’re still seeking people with media skills to help us promote Peace Week Delaware statewide. We have great ideas to promote PWD but need someone like you to put those ideas into action. If you can pitch in, email volunteer@peaceweekdelaware.org. Additional volunteer opportunities are described here. Plan – The PWD Steering Committee can always use more brainpower! Email info@peaceweekdelaware.org to receive meeting invitations, agendas, and minutes. The meeting calendar is here. Give – The Movement for a Culture of Peace is grateful for the outpouring of support for Peace Week Delaware – but many of the things we’d like to do depend upon receiving additional funds. If you, your organization, or group would like to financially support Peace Week Delaware, please visit our Support page. We can astonish our state with our commitment to change. Our goal is to build Delaware’s capacity to work together to solve our problems and create a culture of peace. Our vision is that Delaware will become known for its transformation from a culture of violence to a culture of peace. Visit www.peaceweekdelaware.org to find out how you can become involved. If you have questions, reach out to info@peaceweekdelaware.org. The Steering Committee is excited about how the plans for Peace Week Delaware 2017 are coming together. It’s time to meet again, to expand the individuals and groups involved, and to develop plans for specific events. Please come with your plans for an event and be ready to collaborate with others. From September 18–25, peace-loving folks across our state will celebrate Peace Week Delaware—a statewide series of events raising awareness and hope for peace in our communities, nation, and world. We encourage you and your organization to join in by helping to create the inaugural Peace Week Delaware. What is Peace Week Delaware? Peace Week Delaware is an expanded vision of peace led by the Movement for a Culture of Peace, which organized peace marches in Wilmington in 2014 and 2015 and has held monthly public forums on how to achieve peace and address the impact of violence. Last September’s march drew 400 participants from dozens of organizations across Delaware, demonstrating that our state wants to create a new paradigm of peace—and a new level of peace activism. Peace Week Delaware will provide a coordinated outlet for that energy, widening the circle of nonviolent action across the state. 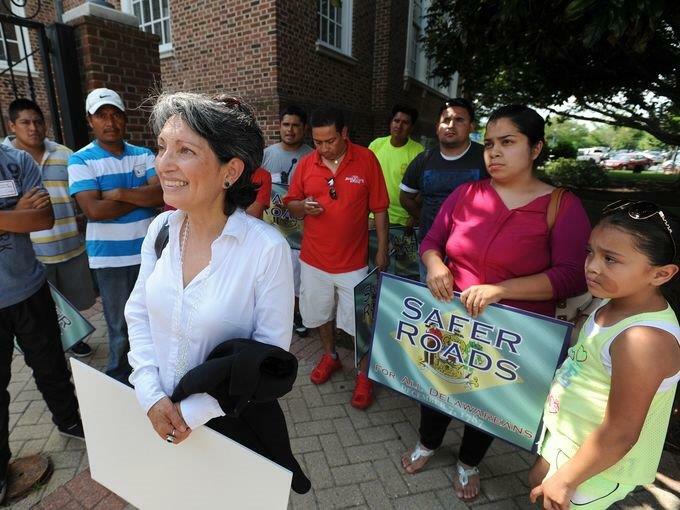 The week of September 18–25 brings Campaign Nonviolence Action Week to life in Delaware. Who is involved? The Movement for a Culture of Peace and its community partners are behind Peace Week Delaware. An independent committee—the Peace Week Collective—began meeting in February to mobilize community participation and organize events for this week. A number of non-profit organizations, neighborhood groups, churches and individuals have committed to creating Peace Week Delaware together. How can we get involved? There are two ways. One, organize a Peace Week Delaware event. You can do this through your organization or as an individual or neighborhood. Visit www.peaceweekdelaware.org to find Peace Week ideas and an FAQ about how to create your own Peace Week event. Leverage our website and social media program to get the word out about your event. Two, work with the Peace Week Collective on one of several events already in the works—an art exhibit, an interfaith peace vigil, a concert, and the third annual March for a Culture of Peace led by the Movement for a Culture of Peace. You’re welcome at any meetings of the Collective to learn more about how to contribute to Peace Week Delaware. Meetings are listed on the website. And, of course, we hope you and members of your organization will attend these events. What if I have more questions? Visit www.peaceweekdelaware.org or email info@peaceweekdelaware.org. a greater difference if we act together as one Delaware.